Methodism in the South began to spread during the late eighteenth and early nineteenth centuries due to the efforts of Bishop Francis Asbury, who traveled to small communities to preach on circuit rides. Bishop Asbury is said to have visited Union County during this time, and a frame meeting house was established by 1826 to house a new Methodist congregation that was likely inspired by his sermons. Prior to the Civil War, the church planned to build a large sanctuary for the growing congregation; however, the war delayed the project. Construction on the granite church seen below began in 1871, and by 1872 worship services were being held in the new space. The wooden church was relocated when it given to a black congregation in 1873; this group used the frame building until 1893 when it was razed to make room for the Union Cotton Mill. The church was given the name “Grace” by member Benjamin Dudley Culp, who donated the granite from his own quarry. The land on which the church and graveyard rest was donated by A.W. Thompson. 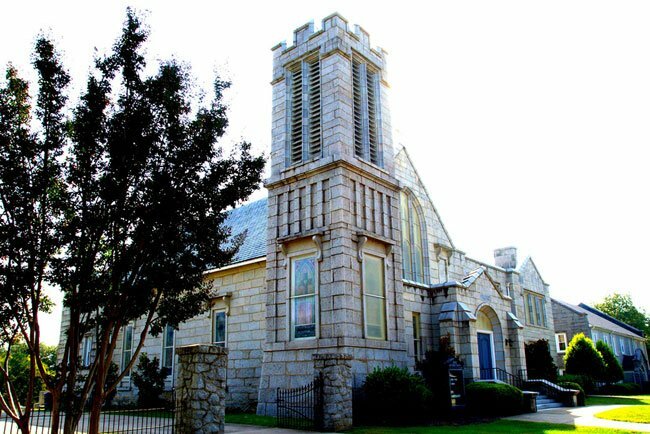 Though the church was utilized in 1872, Grace United Methodist Church was not completed until 1873. At the time, the corner belfry did not yet exist; instead, a short center tower lent to the church’s Gothic appeal. The belfry was added around 1883, though it was originally shorter than it is today. The upper stage of the tower was added between 1917 and 1919. During those years, the church itself was modified and enlarged. Granite used for the project was cut to match the original stone, giving the church its current appearance. The two-story granite Sunday school building was completed in 1964 and connects to the sanctuary with a breezeway. The South Street-South Church Street Historic District is a significant collection of 88 properties along South Street, South Church Street and South Pinckney Street. This district is primarily residential in character and includes properties dating from ca. 1850 to ca. 1930, with the majority dating from ca. 1850 to ca. 1915. The district developed as an important residential neighborhood near the commercial center of Union. The district includes the finest collection of period residences of the late nineteenth and early twentieth centuries identified in Union, and represents well the characteristics of an upper income residential sector in a small town of the era. Many of the community’s most distinguished architectural specimens are located in the district. The character of the district is defined by many large-frame Queen Anne inspired houses built ca. 1880-1910, in addition to Neo-Classical, Gothic Revival, Colonial Revival, Tudor Revival, Four-Square, and Bungalow style buildings. The district includes the first Carnegie Library established in South Carolina. There are 14 key properties, 57 contributing properties, and 17 noncontributing properties in the district.